I was quick to make myself available for that. The Valley Wing is the premium wing of the Shangri-la Orchard. 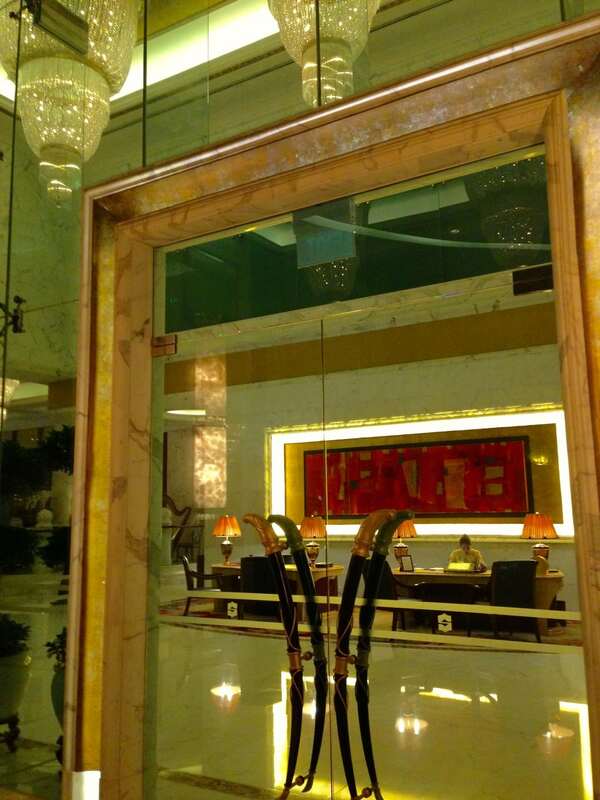 The lobby area is grand, with several chandeliers and shinny golden appliques. The lounge is decked in plush carpets in earthy ochre tones and Renaissance furniture that reminded me of the years of France’s splendor. References to Shangri-la are scattered around. Paintings of the mystical mountain in China hang on the walls, often times as large wall murals. We entered the hotel through the main entrance as the taxi driver was not familiar with the separate wing. Truth be told, of the 4 taxis we took during our stay none knew about the Valley Wing so we were dropped off at the main lobby every time. As soon as we mentioned “Valley Wing” to the gentleman at the reception we could see his face light up and his smile widen. He escorted us all the way to the other wing through corridors, hanging passages and golden elevators. As soon as we took our seat a glass of champagne magically appeared while the check-in formalities took place. Check in was electronic, so we had to walk to the reception to sign on their electronic pad. Together with our keys we received a small paper with the details of what was on offer at the lobby. 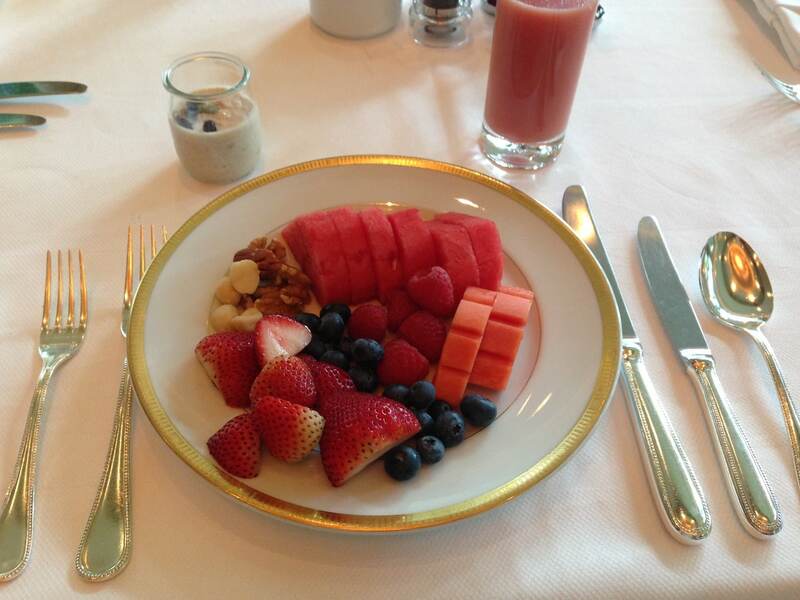 Breakfast was served in the very grand wedding style Summit Room with circular walls and views onto the garden. From 11am, when breakfast ended, savory snacks would be available. At 2pm, teatime would start and last until 5pm when we could move onto canapés and drinks. Champagne was available throughout the day. Needless to say we tried and tested all 4 menus. Tea time featured the usual suspects, fruit tart, macaroon and finger sandwiches with smoked salmon, egg and cucumber. They were soft and moist, just how I like them. The sweet selection was not as good and in fact we only received one serving of each of the cakes and sweets instead of two. The canapés were elaborate but we also got given only one serving. I found the service at the lobby to fall short and they made us work for every food and drink we got. We had to continuously order and were not proactively offered anything. We were not told there was a buffet spread available in the afternoon instead chasing the waiter every time we wanted a refill or some more snacks. As the lobby is very cold with the usual Singaporean AC at full speed we decide to sit in the outside garden, more pleasant and lush and not a single waiter comes out to serve any of the guests once. By the time we leave almost at 7pm the rest of the guests have not got a single drink. Water is not offered, we have to ask for it and, as there is no service, the water glasses are also not replenished. The value offered is high but we end up wondering if they are controlling costs by simply making it so hard to get served that you consume much less than you would have. Surprisingly, they do not have a tea list, even during teatime, so when I ask for a non-caffeinated tea the waitress cannot suggest anything other than chamomile. She is not very well versed in the tea world and ends up recommending green tea despite my ask for a non caffeine option. Aside from the benefits in the lounge internet is also free through the lobby and the room. As I am writing this review I realize that a lot of the benefits of the Valley Wing were not explained to us. It seems that we had a personal butler just for us at the Suite and free minibar (except alcohol and snacks) which we were not told about. This is one of the best rooms I have ever stayed at. It is not because it features any high-tech or advance amenities or because it has designer finishing or furniture but because there are a lot of details that show the care that has gone into making guests feel comfortable and at home. The suite has great views over the city. Just on the 12th floor but slightly elevated the hotel offers unobstructed views of the area. The bed is large, made of two queen beds put together. The desk area is full of useful stationary items. There are staplers, paper clips, glue, a pair of scissors and other items I have never seen in any hotel room. 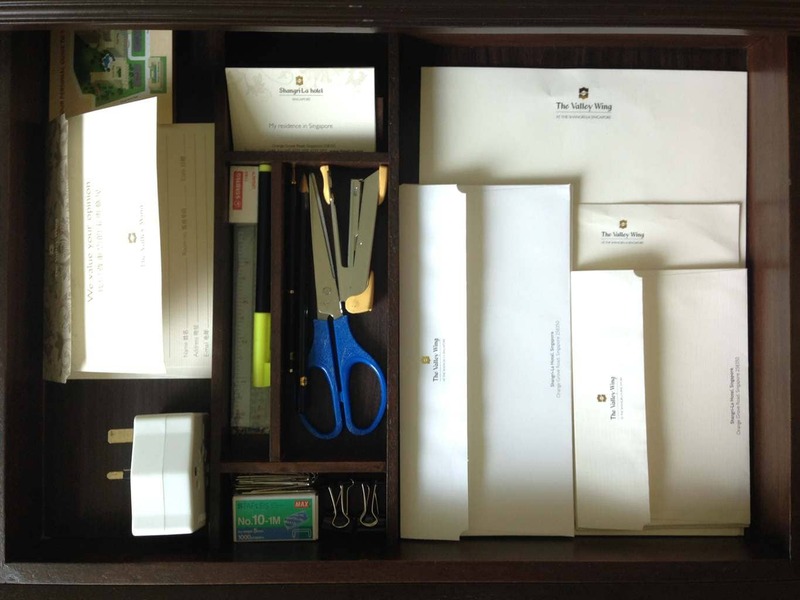 The minibar is neatly stocked and organized. The various bottles and snacks are placed as if they were in a showroom. The fridge is full with all sorts of drinks including a small bottle of Veuve Clicquot. 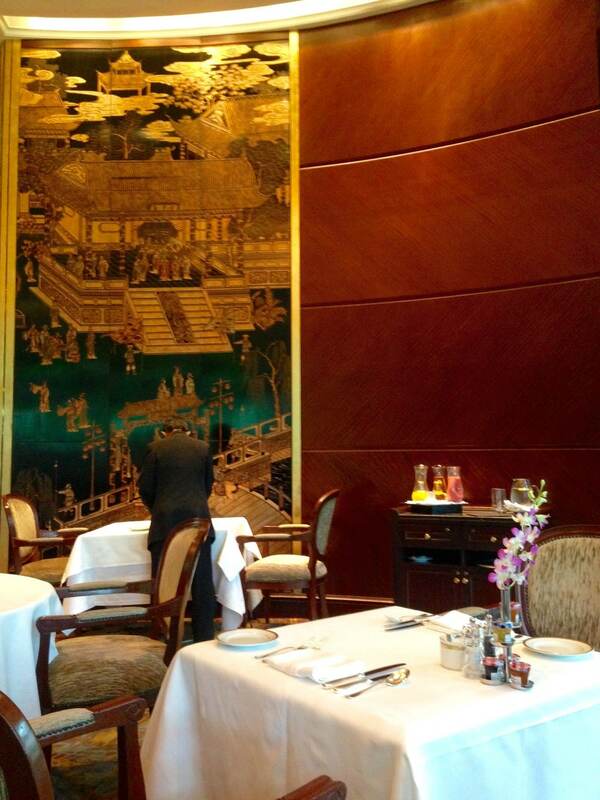 The china, just like in the lobby, is ornate and decorated in golden and blue tones like the rest of the wing. We have all sorts of cutlery, plates, cups and even tiny Japanese teacups. There is also a large selection of tea bags and an espresso machine with three types of capsules. The welcome fruit plate is places in a beautiful ceramic bowl with the same design as the rest of the china. The bathroom is remarkably modern and very well thought out. The shower is easy to use, not one of those that you are unclear as to how to make it work and end up being hit by a gust of freezing water. The bathtub is big enough for two and comes with a handy neck pillow. Many bathtubs are nice to look at but uncomfortable, the neck pillow is a nice touch. There is also a TV on the wall in front of the bathtub so you can relax watching your favorite movie. There are several other small touches that show a lot of thinking has been put into making this the most convenient environment. The amenities are from l’Occitane and replenished enough so you don’t run out. The door to the toilet room actually closes properly so if you share your stay with someone else you can have real privacy. The mirrors do not get steamed even after having a long hot shower. Towels are large and plush without leaving a trace of fluff. What I found truly unique were some of the amenities that were included inside a personal amenity kit similar to the ones you get when you fly Business Class . It included a lipbalm, a small hand cream and a pair of stocking and business socks for men. I have never seen such level of detail in any hotel room before. The dressing room (yes, there is a space where you can get dressed) contains a large box where everything for taking care of your shoes is contained. We were both wearing flip flops so that was of no use to us but I could see how they had upgraded the shoe shine experience to its own classy wooden box. There was also a dressing table with a large mirror and a small make-up personal one. This was very convenient for us as we were sharing the room and while one was getting a shower, the other could perfectly get pampered on the dressing table. As is common in other hotel rooms there were a few distinctly luxury magazines available for reading. We had the Singapore Tattler, Wine & Dine and Affluent. If you were looking to blast music from your own music device through the room’s sound system there was also a cable for this. Just plug your iPhone and wait for the music to play. All the lights and curtains were electrically operated through the panel by the side of the bed. As opposed to other rooms where you have to flick through all the switches to get the right one and then realize you still need to get up to switch off that stubborn hallway light here everything was clearly labeled. We could open the curtains just by flipping a switch and from the comfort of our beds thus getting all excited at the sunny weather outside. All the items that could be branded with the signature VW initials were indeed branded. This included the tissue and the toilet paper as well as the more obvious china, pens, etc. The high quality and amount of planning that went into the rooms was not reflected in the common pool area. The Valley Wing shares the pool with the rest of the hotel and, being a weekend, it was clear that the hotel caters to families from the region. The pool would have been large enough to accommodate everyone if it wasn’t because the main area by the water was filled with running and screaming children. We were not there to hear other children play around but to relax and enjoy a bit of disconnection. The set-up and the amount of trees, flowers and green grass would have allowed for that without the noise generated by the families. The hotel has placed a few sunbeds to the side, facing the Valley Wing and away from the swimming pool, on the green grass and under the trees for what I can imagine is an attempt at catering to the needs of everyone else, but the noise could still be heard. That part was fully used by older couples and us. The vast majority of the clientele seemed to fall under the family category. This was a shame because, even if you chose to stay as far away as possible from the families you were not able to enjoy the refreshing water and, with Singapore’s high temperatures all year round, that meant we did not spend much time by the pool as it was anything but a relaxing experience. We enjoyed breakfast at the hotel’s Valley Wing private breakfast room, the Summit Room. The room is compact and it was full throughout our one hour there. In fact, at a point, some guests had to wait for the table to be ready. The buffet spread included a large selection of fresh fruit including the elusive blueberries, strawberries and raspberries, so uncommon at hotel buffets. There was a large selection of premium nuts, cereals and lots of bread and pastries to choose from. The quality was also of high standards. As opposed to most buffets the spread was very pretty to look at, as if it had been prepared by a creative designer. Aside from that, we were given, not before having to ask for it, an a la carte menu of cooked breakfasts from all over the region. You could choose from the international egg options to a Japanese breakfast, a Malay option, a Singaporean spread, an Indian traditional breakfast, you name it. We both got eggs and they came with the selected accompaniments. We were also given a pretty cut mango. Everything was well presented and the room was as grand as the rest of the lobby with the branded china and the chandeliers. The waiters were dressed in full attire. As in almost every single hotel breakfast, the coffee was the only disappointing element. My unresolved mystery. Tea was served in a pretty teapot but, just like the previous afternoon when I had ordered it at teatime, it came with a large amount of hot water where a single bag was swimming. We had to request another teabag be added to make the tea with the right strength level. As we had not paid for the stay it was obviously great value for money. However, a quick search online for June suggests that the price for the Deluxe Room at the Valley Wing is around SGD670 per night. 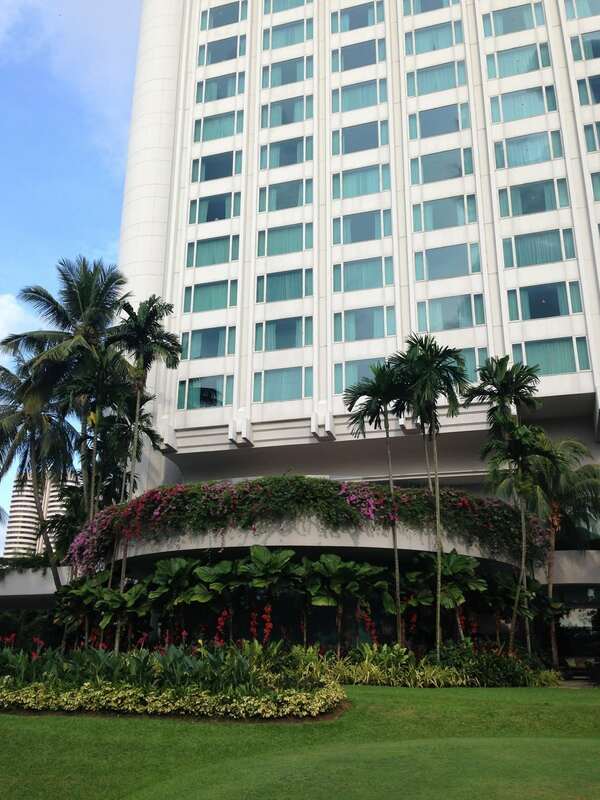 To have a reference, this is what the Raffles or the Capella, two great hotels, charge for the night as well. With this price in mind, the benefits that come with the Valley Wing are only worth it if you are the type of person who likes to lounge around and have to chase waiters to get your glass refilled or more canapés served. If you plan to chill by the pool this may not be the right place for you. Not just because peace was the last thing available poolside but because all the benefits were only provided at the lounge and not by the pool, a shame and something which deemed the experience not worth it for us. 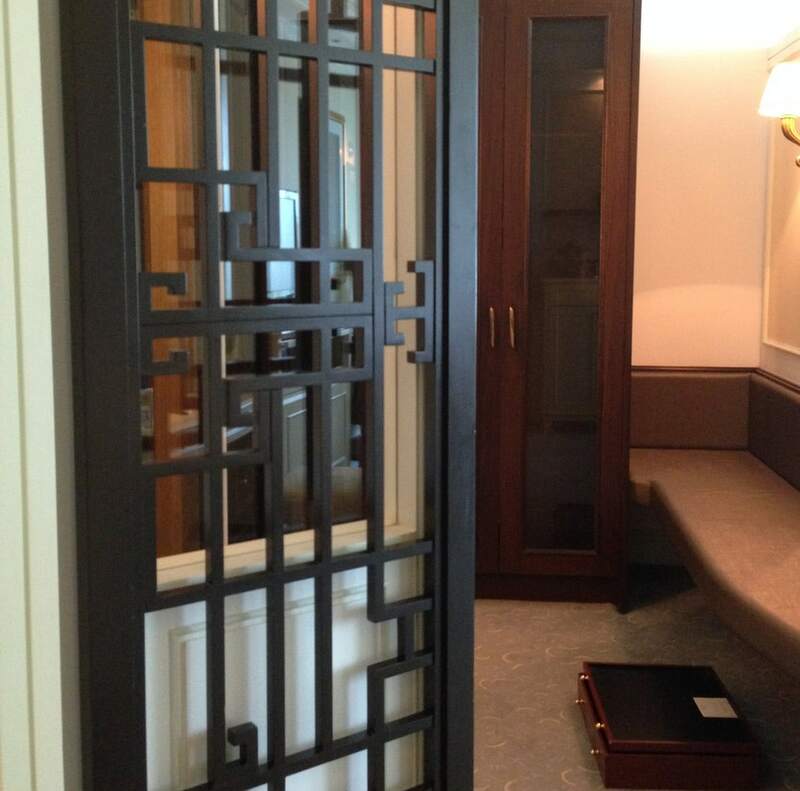 The room was one of the best I have ever slept in and could be a reason in itself to consider staying here but in my case, for this price, I would rather stay at any of the other super-luxury options in Singapore.